These are indeed a robust pair of walking boots. From the bottom up, there's a quite aggressively (5mm) lugged, very stiff Vibram sole, a 3cms rubber rand, a very substantial toe box with good heel protection. They offer good grip on all types of surface and the stiff Vibram sole will take a crampon when the ground is covered in snow and ice. 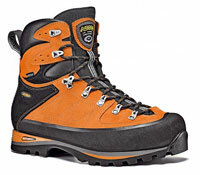 On your feet, the Asolo Khumbu GV MM Walking Boots feel solid and secure, and very, very comfortable. The lacing system is one of the best I've seen recently; it includes an extra loop on the tongue through which you can thread the laces after tightening and locking the lower lacing system. This ensures the tongue is correctly positioned for maximum comfort and weather protection as you tighten the boot round your ankle. A simple, clever but effective innovation. I was wearing my normal size and the fit was true to size. The cuff comes up quite high to offer considerable ankle support - but not so high that it becomes irritating or rubs on your lower shin. I've been testing the Asolo Khumbu GV MM Walking Boots on day walks in the Lake District and Peak District carrying a full winter day pack. There is a gentle (rather pleasant) rolling sensation as you walk (more pronounced on tarmac) as the boot pivots around the ball of your foot. The traction is excellent on wet grass, mud, wet rock and scree. The Asolo Khumbu GV MM Walking Boots are exceptionally comfortable boots over pretty well every type of terrain I've tried so far - stone, sharp rocks, asphalt, mud (lots of that!). The weather has generally been very wet and the ground muddy and soaked - but throughout my feet have remained warm, bone dry and comfortable. Excellent 3-4 season walking boot for all types of terrain and conditions - from short one-day winter walks to multi-day long distance back packing expeditions. The Asolo Khumbu GV MM Walking Boots may appear to be on the expensive side when compared to other boots in the shop - but if you need one boot for all types of walking - and believe that if you take care of your feet, they will take care of you - then you should seriously consider the Asolo Khumbu.